Science Desk: What Does an Underground Mine Look Like? By now, you’ve no doubt heard that Twin Metals proposes to build a massive underground mine on the edge of the Boundary Waters Canoe Area Wilderness and upstream from Voyageurs National Park. Minnesota Public Radio described the resulting operation as a “vast underground city.” Though used to downplay concerns about the impact of the mining activity, the underground design still leaves plenty of pathways for significant negative environmental impact. Putting aside the fact that Twin Metals’ own Pre-Feasibility Statement states that the Maturi Southwest deposit “will likely be mined to the surface at some point in the future” (see PFS [PDF], page 14-30), it is crucial to understand the multitude of ways an underground mine will still impact the surface. Two months ago, we detailed the toxic leaks, seeps and spills that are likely to occur. These byproducts result from surface waste storage ponds; the tailings storage facility slated to hold 234 million tons of toxic tailings; the tailing pipelines throughout the area; and even from the underground caverns themselves. Last month, we discussed the habitat loss and fragmentation from paste plants; a 1,000-acre concentrator plant facility; a 7,000-acre tailings storage facility; and increased traffic. What would that surface infrastructure look like, and what impact would it have on the environment? Underground mine infrastructure from other parts of the world, such as the world’s largest underground copper mine in El Teniente, Chile, (pictured left) can give us a sense. Other infrastructure would include four paste plants built above the Maturi and Maturi Southwest deposits. These industrial plants would mix tailings, cement and fly ash before the mixture is then pumped underground. Thirteen ventilation facilities are currently planned to be built, to ensure miners deep underground have sufficient air to breathe, and these systems can be quite large. The axial-flow ventilation at the Kriel coal mine in South Africa (pictured right, photo courtesy of Dr. Steven Bluhm) and the Turf No. 3 Vent Shaft at Newmon’s Leeville underground mine in Nevada (pictured left, below) are some examples of ventilation facilities used with this type of mining. Besides the destructive physical footprint and negative visual impact of these facilities, they would have a noticeable noise impact. Fans from the ventilation facilities, diesel engines from round-the-clock truck transport and even surface crushing of ore (for at least 13 years) would drown out the natural sounds of the Northwoods. In addition to disturbing human environment, the constant and continued noise pollution could have severe impacts to wildlife. Studies have shown that noise alone can harm birds, as detailed in a recent New York Times article. When researchers built a phantom road out of speakers, birds affected by the noise had significantly less body weight when the road was “on” than when it was “off.” The researchers in that study and others hypothesize that when too much noise drowns out the early warning systems birds and other animals use to warn of predators, they spend too much time worried about being eaten and not enough time looking for food. Combined with a harsh northern Minnesota winter, the impacts of such constant noise could be disastrous. These examples of surface infrastructure are not the only ones that would be involved in building and running a “vast underground city.” A truly massive industrial zone would have to be created on the surface to support the workers, trucks and machinery busy at work below. Fueling stations, high voltage transmission lines (with their own distinct hum), chemical storage tanks, water retention ponds and even sewage storage or treatment facilities would create their very own surface city on top of the one underground. Science Desk: What about the Moose? I remember the first Boundary Waters moose I ever saw. We’d just finished our evening camp chores--washing pots, taking down the clothes drying line, and hanging our food in a tree--when I heard a crash of underbrush across the small lake. Dusk was falling, and with it came the Interstate-loud drone of June mosquitoes. Despite the clouds of bugs, I ran to the rocky canoe landing to investigate the disturbance. As light faded from the spruce bog on the other shore, I saw a dark shadow move, then bolt. It splashed into the water, and I could tell from its gangly height and massive build that it was that iconic animal of the Northwoods: a moose. Over the next six years that I instructed multiweek wilderness canoe expeditions in the Boundary Waters, however, I saw fewer than half a dozen. Ask most wilderness travelers, and they’ll tell you that a wildlife encounter can take a good experience in nature into the realm of the incredible. In fact, studies conducted of people who visit wilderness areas show that wildlife viewing is a highly desirable outcome during their wilderness experience (Driver et al., 1987). The benefit of these experiences ranges from the mundane (seeing animals is exciting, and they’re cute!) to the sublime. Observing animals as they go about their lives with little interference from human activity is awe inspiring, as the experience can help us connect to something larger than our own lives (Driver et al., 1987). Meeting a black bear or snapping turtle with bare toes can get the heart pumping and adds to the authentic wilderness experience--not only have you survived the perceived danger of the woods, but it makes a great story to tell friends and family. Wildlife contribute more than just exciting or spiritual encounters. Animal behaviors can actually physically impact the environment, and they play a major role in creating a functional ecological system. In landmark studies conducted on Michigan’s Isle Royale National Park in the 1980s, ecologists found that moose’s food preferences played an important role in determining the types of shrubs and small trees present in the forest understory. “Selective browsing,” as it is called, in turn affected the types of leaves on the forest floor, which in turn influenced the types of microbes present in the soil. Thus moose likely played an important role in the cycling of nutrients in Isle Royale’s boreal forest, which is similar in a lot of ways to the forest in and around the Boundary Waters (Pastor et al., 1988). It is just such complex relationships among ecological processes that are significantly threatened by industrial activity, such as those involved in sulfide-ore copper mining. Minnesota’s moose are already facing the struggle of their lives. Climate change, disease, parasites and the increased abundance of winter ticks are all implicated in the decline of Minnesota’s moose population in recent years, which led their listing as a state species of special concern. Moose are rare enough now on the Mesabi Iron Range that recent sightings of two young moose near Cherry, Minnesota, drew crowds of spectators. Though they are not as common as they once were, moose are still present in the area where Twin Metals proposes its sulfide-ore copper mine near the Boundary Waters. I’ve seen moose on the Little Isabella River, Rice Lake, and along Highway 1 between the Birch Lake and S. Kawishiwi River bridges. A hiker recently reported seeing fresh moose pellets in the area where Twin Metals proposes to build its 1,000-acre concentrator facility on the shore of Birch Lake. What, then, would happen to the moose that divide their time between the Boundary Waters and the rich Superior National Forest that surrounds it if sulfide-ore copper mining is allowed to proceed along the Wilderness’s border? Large amounts of traffic from commuters and heavy supply trucks would increase the risk of moose-vehicle collisions, a danger not only to moose but also to the people in the vehicles. Twenty-four-hour noise, lights and dust pollution could make the National Forest on the edge of the Boundary Waters inhospitable for moose. 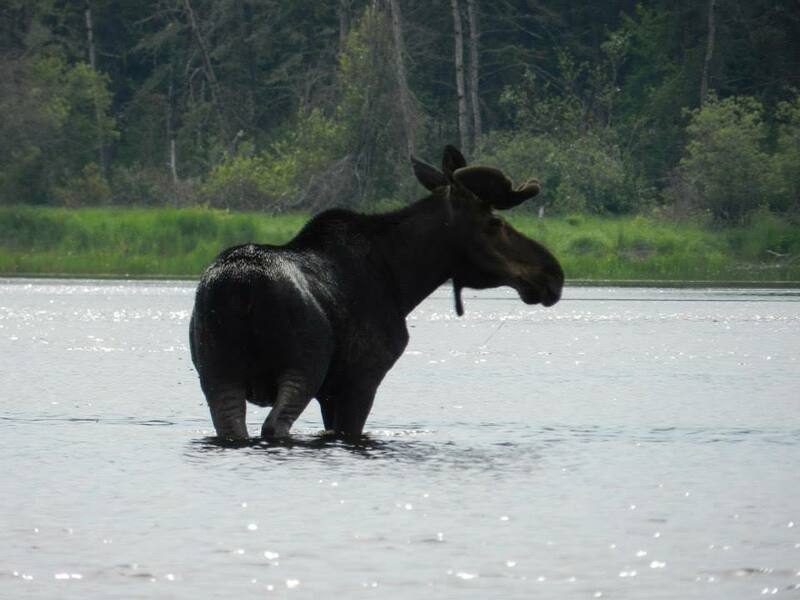 Additionally, Research at the Natural Resources Research Institute suggests that cow moose seem to choose sites for giving birth and hunkering down for the first handful of weeks afterward with preference for “conifer swamps and riparian areas near beaver ponds or small rivers,” which the area near the proposed Twin Metals site has in abundance. Added to the existing difficulties that moose face, these stresses might tip northeastern Minnesota’s moose population over the edge. Should moose suffer this fate, wildlife watchers, wilderness travelers and hunters would lose the opportunities to experience such incredible creatures. Northeastern Minnesota’s boreal forest may also lose a crucial actor that helps govern the makeup of tree and shrub species, as well as the microbe and nutrient cycling processes in the soil. Are we willing to take that risk? Pastor, J., Naiman, R. J., Dewey, B., & McInnes, P. F. (1988). Moose, microbes, and the boreal forest. BioScience, 38(11), 770–777. Have you ever wondered just how sulfide-ore copper mines pollute their surrounding environments? It’s a good question, because in order to understand the environmental impacts to the Boundary Waters Canoe Area Wilderness and Voyageurs National Park, we must first understand all of the ways sulfide-ore copper mining can cause harm to the surrounding lakes, streams, wetlands and forests. Independent studies show many vectors of pollution, and combined they create a significant risk of contaminating the Boundary Waters. Sulfide-ore copper mining is a risky type of mining that has never been done before in Minnesota. No matter the method, sulfide-ore copper mines proposed near the Boundary Waters would extract trace amounts of metals from large volumes of rock. Rock is blasted from pit walls and sorted into metal-bearing ore and waste rock. In the mine's first years, 4.1 million tons of waste rock will be stockpiled on the surface while the mine is hollowed out. The sulfide-bearing ore deemed to be economically valuable is crushed to increase surface area and then sent to a surface stockpile before entering the concentrator plant where the metals are chemically extracted. Since less than 1% of the rock contains metals of interest, ninety-nine percent of the rock mined turns out to be economically value-less and will remain in perpetuity in the tailings storage facility, waste rock storage piles and as backfill in the underground mine itself. No metal recovery method is 100% efficient, and metals and sulfides are left behind in the tailings. Tailings also contain residue from the explosives used to blast the pit wall, chemicals used to separate metals from sulfide minerals, and other ore components with little economic value. When sulfide minerals in ore, tailings or waste rock are exposed to air and water, acid mine drainage develops. Oxidation and hydrolysis reactions turn otherwise benign minerals into toxic materials, including acid, metals (e.g., mercury, copper, nickel, lead and zinc) and sulfates (Jennings et al. 2008). Acidic conditions further catalyze these reactions, making them proceed at faster rates than would otherwise occur (Jennings et al. 2008). Run-of-the-mill pipeline leaks and seepage from underground mine sites are also serious vectors for contamination as shown by Dr. Tom Myers, a hydrology consultant who has studied the preliminary plans for mines proposed near the Boundary Waters. The Twin Metals pre-feasibility study calls for a massive network of pipelines to dispose of sulfide-, metal- and chemical- laden tailings. Half of the tailings would be piped from the 1,000-acre concentrator facility on the shore of Birch Lake; the other half would be piped back underground. Based on industry history (Earthworks 2012) and the danger of northeastern Minnesota’s extreme cold freezing and blocking pipes, this pipeline network carries a high risk of failure. In addition to tailings dam failures and pipeline leaks, sulfide-ore copper mines can pollute through seepage from underground pits and surface waste rock and sulfide-bearing ore. These pollution vectors are hard to detect and difficult to fix. By exposing sulfides minerals in the pit walls to oxygen and water, they are able to produce acid mine drainage. Cracks in the bedrock connecting the underground mine to groundwater can then transmit the generated acid mine drainage to streams, lakes, and some wetlands. It is reasonable to expect that underground seepage of pollutants from the Spruce Road deposit owned by Twin Metals would eventually penetrate the Boundary Waters, according to modeling conducted by Dr. Myers. Any surface storage of waste rock, tailings and sulfide-bearing ore also creates the opportunity for water bearing acid, heavy metals, or sulfates to seep into groundwater despite engineered liners designed to contain them. All liners leak to some extent, and no liner has been tested over the decades and centuries required to permanently protect the Boundary Waters from pollution from sulfide-ore copper mining. In light of the combined facts that sulfide-ore copper mining on the edge of the Boundary Waters would likely contaminate the Boundary Waters and surrounding lakes, rivers and streams, and that the industry has a poor track record of preventing water quality impacts, it is clear that sulfide-ore copper mining would be too risky for the Boundary Waters Canoe Area Wilderness and Voyageurs National Park. Earthworks. 2012. "U.S. Copper Porphyry Mines Report: The Track Record of Water Quality Impacts Resulting from Pipeline Spills, Tailings Failures and Water Collection and Treatment Failures." Earthworks, Washington, DC. Jennings, S.R., Neuman, D.R. and Blicker, P.S. 2008. "Acid Mine Drainage and Effects on Fish Health and Ecology: A Review." Reclamation Research Group Publication, Bozeman, MT. If you’ve attended a Campaign to Save the Boundary Waters presentation or read any of the Campaign’s materials, you’ll notice our tight focus on the Boundary Water Canoe Area Wilderness and Voyageurs National Park watershed. A watershed can be a difficult concept to grasp, as the boundaries aren’t searchable in Google Maps, let alone marked on a traditional highway map. Understanding the watershed boundary--and what it means for the direction of water flow--is crucial to understanding the risks posed to the Boundary Waters and Voyageurs from sulfide-ore copper mining. A watershed is defined as all of the land that drains to a specific point, like the drain of a bathtub. At a more complex level, an urban sewer grate’s watershed is comprised of all of the gutters, sidewalk, streets, driveways and grass strips that flow into it. Small streams tend to have small watersheds that build upon each other as small streams combine to form larger streams and rivers. Thus the whole state of Minnesota can be seen as layered watersheds of different sizes, much like neighborhoods combine to form towns, which form counties, which form the state. The Minnesota Pollution Control Agency (MPCA) defines 81 major watersheds in the state, and it recently released a great interactive map of them. How is the Boundary Waters & Voyageurs watershed defined? Three major watersheds flow into the Boundary Waters and Voyageurs National Park, according to the MPCA’s map: Rainy River - Headwaters, Vermilion River and Rainy River - Rainy Lake. The Campaign calls the three major watersheds that flow into the Boundary Waters the “Rainy River Drainage Basin.” To delineate these watersheds, hydrologists rely on advanced mapping software and digital elevation models to predict in which direction a drop of rain will flow at any given point. These maps and models form the basis of the MPCA’s 81 major watersheds, which agree with the U.S. Geological Survey’s National Hydrography Dataset (though the names differ slightly). 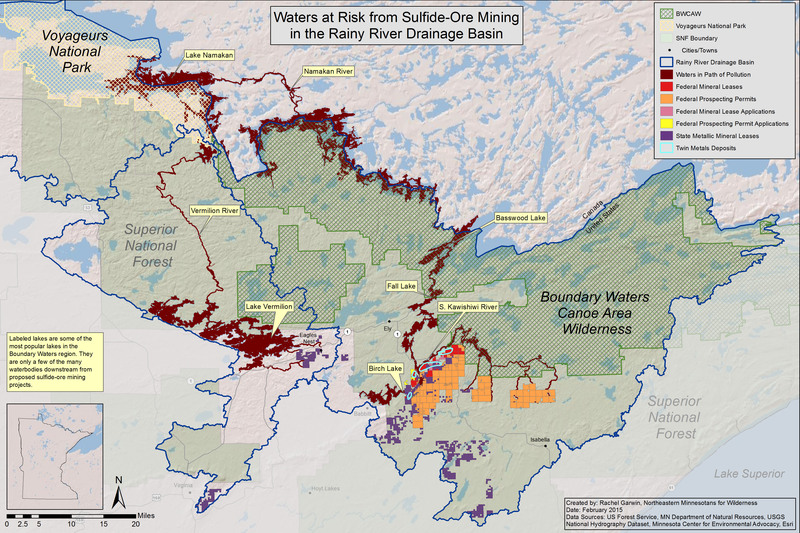 These authoritative maps provide clear boundaries within which acid mine drainage would flow toward the Boundary Waters and Voyageurs, threatening their interconnected lakes, rivers and wetlands. Why do the watersheds matter? 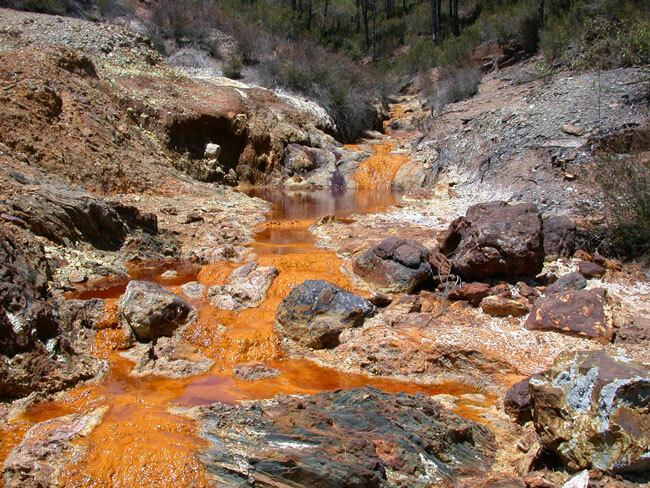 One of the primary risks from sulfide-ore copper mining is the leaking or spill of acid mine drainage--which can include sulfuric acid, toxic heavy metals and sulfates--into the rivers and streams around the mine, as well as into the groundwater which then connects to surface water. Some of the contaminants present in acid mine drainage can travel large distances downstream from their original source. Simulations of realistic contaminant releases show that the contaminants could reach the Boundary Waters from the proposed Twin Metals mine site, on the shores of Birch Lake. Pollutants from proposed sulfide-ore mines near Eagles Nest, Minnesota, could also reach Voyageurs by flowing through Lake Vermilion and down the Vermilion River. Mines located among headwaters also have a larger regional impact than previously thought. By comparing indicators of fish health in streams in the Southeast, Midwest and Northeast with the density of mines in their headwaters, a team of researchers from Michigan State University, Oregon State University and the U.S. Geological Society found that the presence of even one mine was a source of regional stress whose impacts to fish health are felt much farther down the watershed than sampling immediately around the mine site would indicate. From this perspective, then, the Boundary Waters and Voyageurs watersheds must be kept free of potential sources of acid mine drainage in order to prevent the potential for harm to their beloved lakes, streams and wetlands.